October 28, 2017 By Elizabeth Lindemann 16 Comments / This post may contain affiliate links. 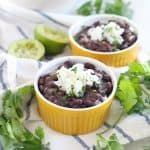 This vegan black beans and rice is a super quick and easy (and CHEAP!) recipe that comes together in only 25 minutes! It’s kid friendly without anything spicy added (baby Zoey LOVES it), and it can be served as a side or as a complete meal. The best part about this recipe is that you probably already have most of the ingredients right this very moment in your kitchen. If you’re like me, you always have fresh cilantro and limes lurking about in your fridge. 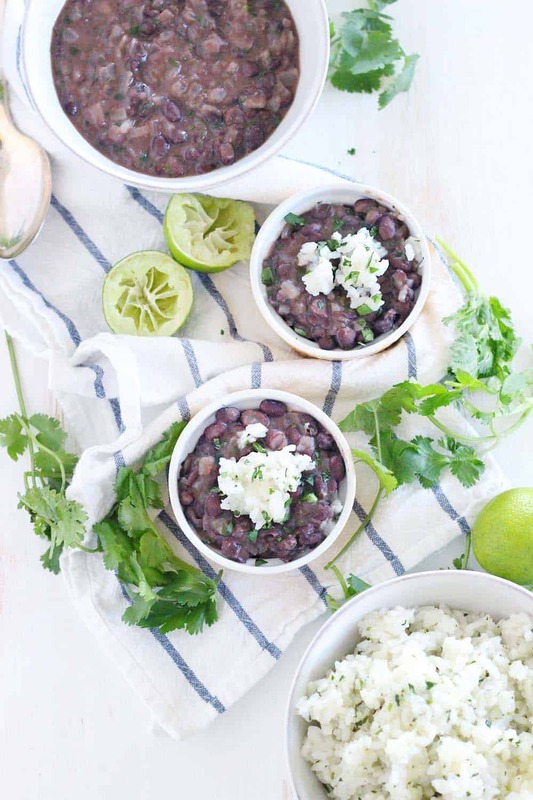 If you keep canned black beans and white rice in your pantry, you’re pretty much set! And yes, I did say white rice, not brown. 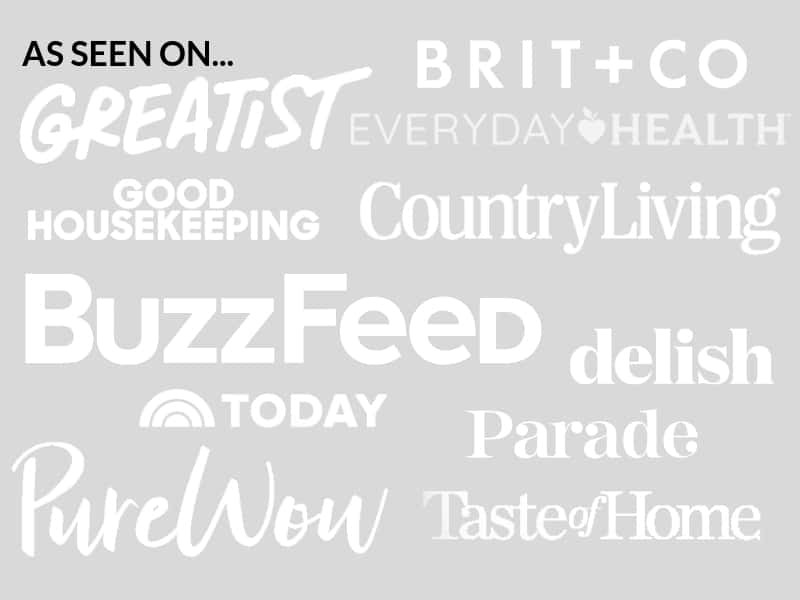 Usually “real food” and health bloggers will use brown rice in their recipes, but hear me out. First of all, it cooks in only 20 minutes, whereas brown takes more like 40-50. Furthermore, white rice can be easier to digest for many people than brown, some people report feeling better after eating it than brown. The rice in this is nothing more than a simplified version of my cilantro lime brown rice (but with white rice) recipe. Use whichever you prefer. The first time I made these beans was very much by accident. I had a batch of frozen Spinach and Chicken Enchiladas Verdes (one of my favorite recipes of all time!) in the freezer, but with only four enchiladas in the batch, I wanted something on the side. Plus, Zoey was starting to eat all kinds of food, so I thought it would be great to get her to try some beans and rice. One can of black beans and some simple seasonings later, I was sold. I wasn’t even planning on blogging about this, but this recipe is SO simple, easy, and delicious, I made it again the following week and actually wrote down what I did this time! OK and when I said baby Zoey loves this, I was really being pretty understated. The truth is, she literally won’t stop eating it, opens her mouth as wide as I’ve ever seen it and leans toward us as a bite is coming toward her, and shrieks like a banshee if she isn’t actively nomming on it. She’s a girl after my own heart for sure! The recipe below states that it serves 4- this is as a full meal. If you are serving it as a side, you can likely stretch it to 8 or 10 servings. Also, you can easily use these rice and beans in burritos, and make them ahead of time to take for lunch all week. 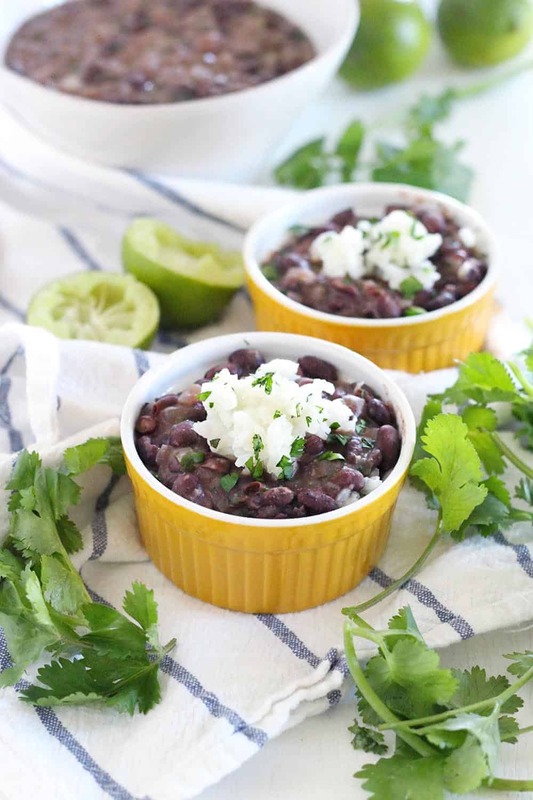 Here’s the printable for Quick and Easy Vegan Black Beans and Rice! 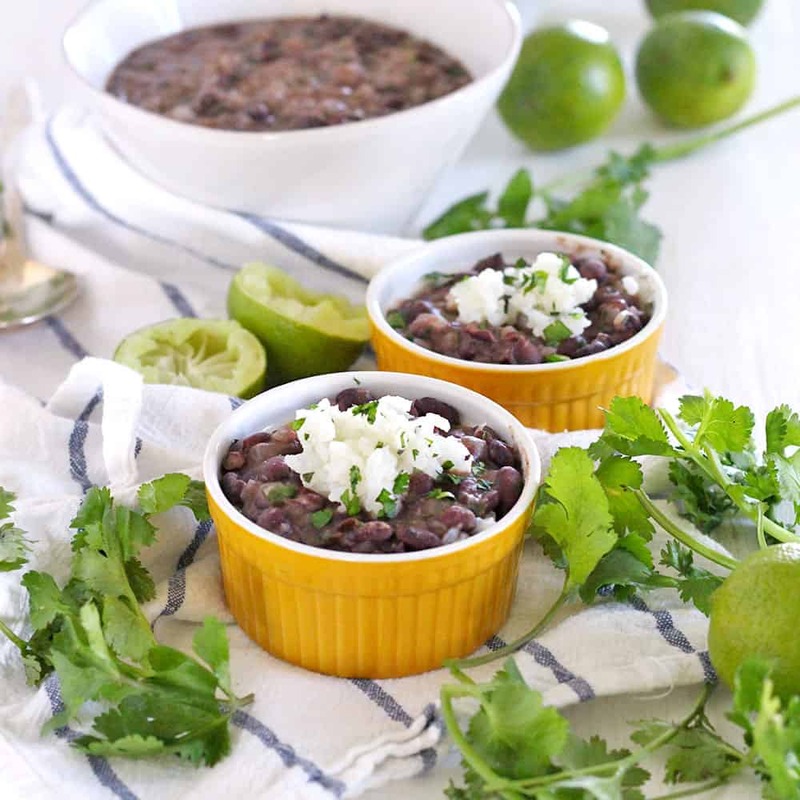 These vegan black beans and rice come together in only 25 minutes! Kid friendly, great as a side or full meal, and packed with delicious flavor. To make the rice, bring water to a boil, add rice and salt, stir, and simmer until cooked (about 15-20 minutes). When done, stir in the cilantro and lime juice and add more salt if necessary. Meanwhile, to make the beans, sauté the onion in oil over medium-high heat in a medium sized pot until softened and beginning to brown (about 2-3 minutes). Add beans, cumin, salt, and water. Stir, bring to a boil, and simmer uncovered for about 10 minutes. Use a potato masher to mash the beans a few times, thickening the mixture, but leaving most of the beans intact. Stir in the lime juice and cilantro and season with more salt if necessary. Serve the beans on top of the rice as a side or meal. Feel free to use brown rice instead of white if you prefer; be prepared to double the cooking time. Hi, I made it twice with soaked beans. It is super tasty and satisfying. We are a vegan family and we loved it paired with a colorful salad with tangy dressing and avocados. We served it in large bowls all together and the flavors are just amazing. So healthy, delicious and cruelty-free! This was awesome! I skipped the onion, put about a third cup of water rather than a whole cup, and paired it with panko cauliflower instead of rice (cut up some cauliflower, put it with olive oil and panko bread crumbs, and put it in the oven for 20-25 minutes at 400 F). Loved it!!! Though I did add concentrated chicken stock to the beans with the water. My 8 & 6 yr old LOVED it! So happy this worked out for you! It’s delicious with chicken broth- that’s what I usually use too. I made this, it’s tasty, easy to make, and healthy! Thank you, I’m trying to become vegan and this recipe has helped me a lot. Loved it, and will make again. I am one of the 20% of people for whom cilantro tastes like soap. Can you think of another herb I could use in its place, or do you think it would be good just leaving it out? Thanks! I think you could definitely leave it out! You could also try some Mexican oregano- don’t use quite as much, since the flavor is much stronger than cilantro. Hope that helps! Which do I cook first ? I’d get the rice going first and then start the beans, since you can basically just let the rice sit do its thing while you tend to the beans. Once the rice is cooked, if you aren’t done with the beans, just cover and remove from the heat and it will stay warm while you finish! What do you have on the top of the meal in the photo. Is that grated cheese. thanks cant wait to try.